On Tuesday, Feb. 27, the Summit Daily News presented speaker Tony Buettner, with the Blue Zones Project, at the Riverwalk Center in Breckenridge. More than 300 people attended “The Longevity Project” event, which also featured a Q&A session with health experts. To find the path to long life and health, the Blue Zones team study the world’s “Blue Zones,” communities whose elders live with vim and vigor to record-setting age. Buettner’s presentation focused on common diet and lifestyle habits that keep people in the world’s Blue Zones spry past age 100. The Longevity Project was a four-part series featured weekly in the Summit Daily News, focusing on topics such as longevity, health challenges and senior living in the mountains. Click here to find all the stories and videos on our Longevity Project page.More videos can be found with each of The Longevity Project stories. Part 1: Why do residents of Colorado’s mountain towns live longer than anyone else in the U.S.? Part 2: How do Colorado’s long-lived mountain towns stack up to the rest of the world? Editor’s note: This is the final installment in a four-part series. 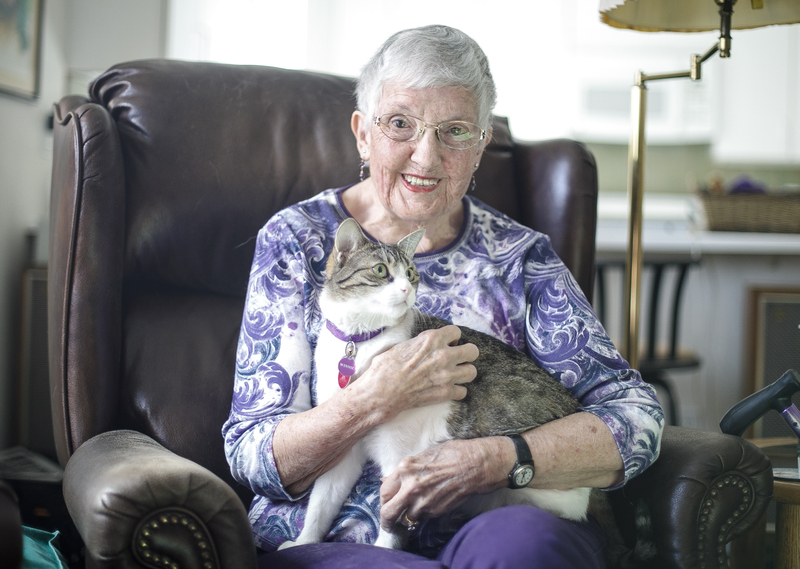 Eighty-three-year-old Anne Crane sits in her Frisco home with her cat, Winnie. “She was found in a Winnebago, so I named her Winnie,” Crane says while scratching the 3-year-old feline behind the ear. Winnie is Crane’s only regular company at home now that her husband Ed, who is 94, had to move down to Arvada for long-term care. Castle Peak Senior Life and Rehabilitation Center’s common area Wednesday, Feb. 21, in Eagle. Williams is on the frontline of an aging boom in the mountains. 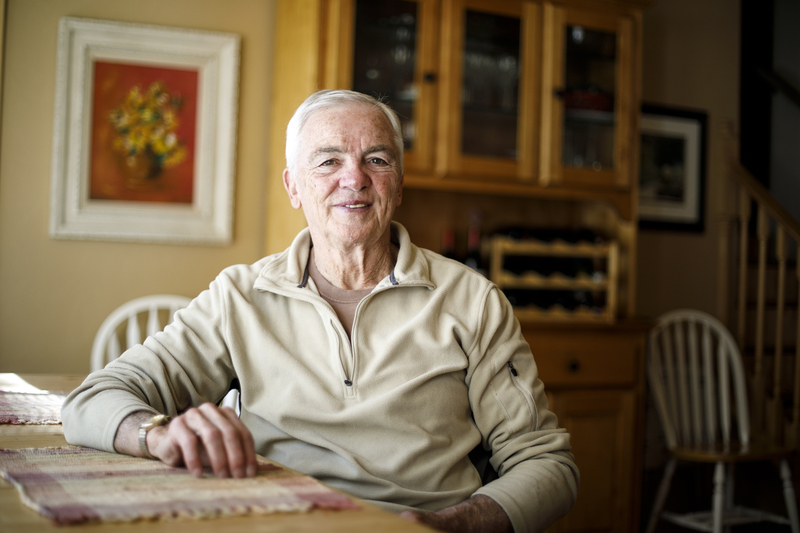 According to the U.S. Census, Eagle County’s population of residents 65 and over went from 5.6 percent of the total population (2,900 seniors) in 2010, to 9.3 percent (5,000 seniors) in 2016. In Summit, the senior population went from 7.7 percent (2,100 seniors) to 11.9 percent (3,600 seniors) in 2016. The median age in Eagle rose from 31.2 in 2000 to 35.9 in 2016, while Summit’s median age went from 33.3 to 38.2 over the same period. Erin Fisher is director of the Alpine Area Agency on Aging, which helps seniors and caregiver access health services in the five mountain counties of Eagle, Grand, Jackson, Pitkin and Summit. She said that mountain communities have some of the fastest growing senior populations in the state. “Summit’s senior population is estimated to grow by 199 percent by 2050 and Eagle County by 274 percent in the same time frame,” she said. For the past three weeks, this series aimed to find out why mountain counties like Eagle and Summit have the highest age expectancy in the country. In this installment, we will focus on the challenges created by that longevity, as mountain communities built for play contend with the needs of their aging residents. The aging issue is national in scope. U.S. Census issued a report predicting that by 2050, the population of Americans 65 and over will reach 83.7 million, roughly double the senior population in 2012. The growth rate of the senior population will eventually outpace the working-age population, leading to an increasing reliance on immigrants to bolster the American workforce, according to the census. An older population also means more medical spending. The 65-and-over citizens only make up 14 percent of the total population, but account for 34 percent of all health care spending, says the Center for Medicare and Medicaid. And according to the National Bureau of Economic Research, the cost of health care more than doubles between the ages of 70 and 90. 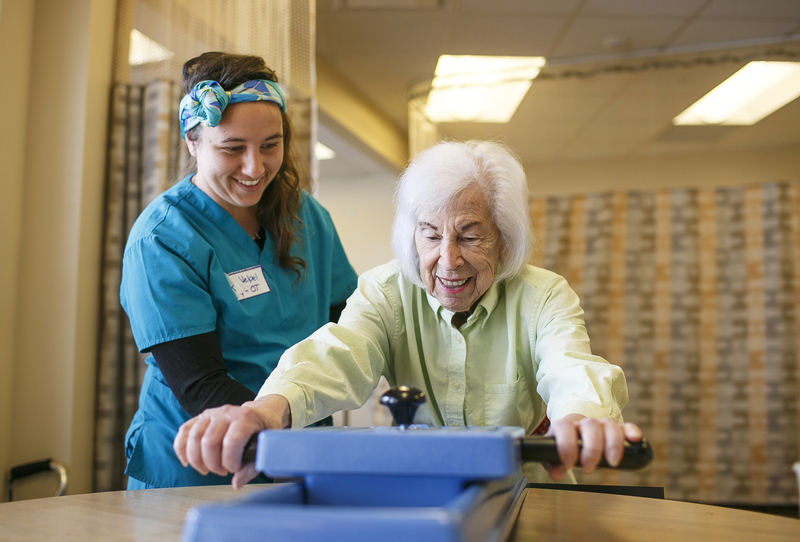 Castle Peak Senior Life and Rehabilitation Center resident, Carole Litt, right, goes through strengthening exercises led by her occupational therapist Erin Velpel during a session Wednesday, Feb. 21, at the assisted living facility in Eagle. Rosen explained that the risks of falls are magnified with osteoporosis, which is caused by bone loss later in life. Osteoporosis results in weak and brittle bones that are more susceptible to fractures and breaks. 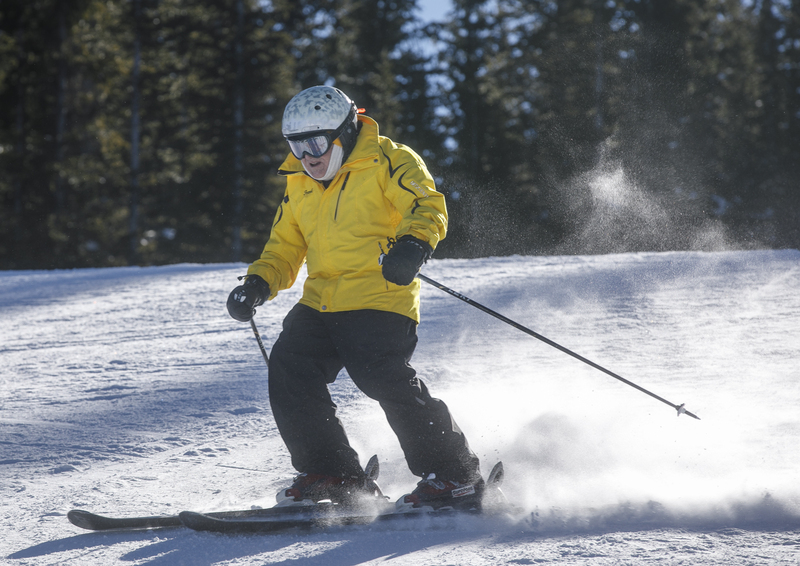 Rosen said that seniors often mistakenly believe that their active lifestyles reduce their risk of serious injury from falls on the sidewalk or on the slopes. “While being active is a protective factor, it does not prevent bone loss,” Rosen said. Paul Chodkowski, CEO of St. Anthony Summit Medical Center in Frisco, said that the hospital recognized that injuries from falls were a significant risk to seniors in high alpine environments, and accordingly instituted a “Stepping On” education workshop to help seniors avoid those injuries. The program trains seniors to recognize and address common tripping hazards at home, as well as what it takes to navigate safely in icy, wintry conditions. Rosen added that there is a lack of specialists for geriatric cognitive conditions in the region, such as Alzheimer’s and Parkinson’s. He has also seen seniors who develop dementia due to multiple brain injuries suffered during their active lifestyle. However, there is a lack of knowledge about these conditions and how they affect seniors at altitude, which Rosen attributes to a lack of emphasis on senior issues. 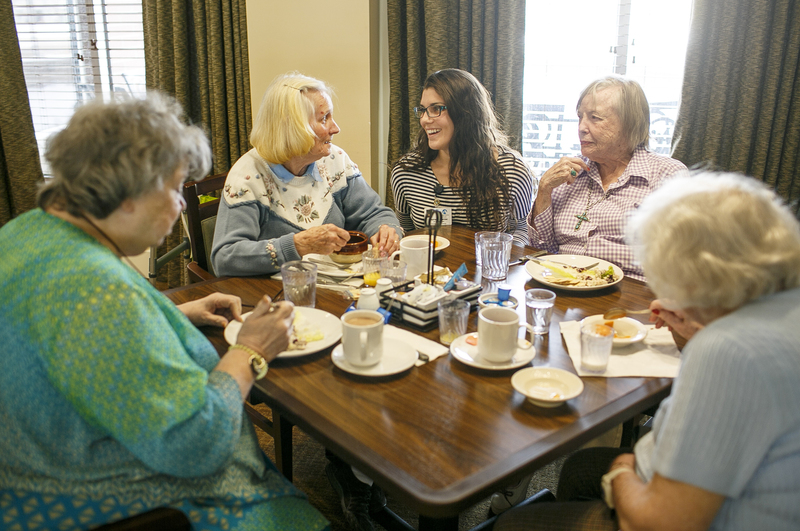 Castle Peak Senior Life and Rehabilitation Center residents interact with employee Stephanie Sheridan, middle, who is the Volunteer Services Director, inside the dining room Wednesday, Feb. 21, in Eagle. 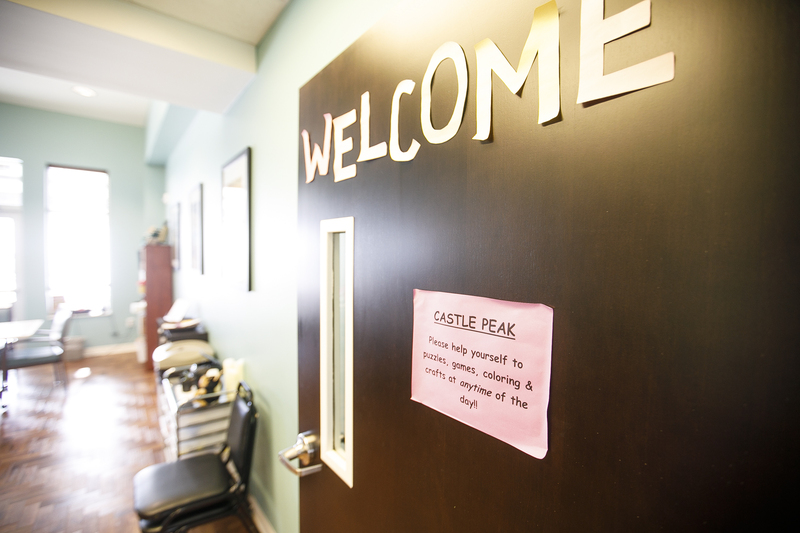 Eagle is home to one of the only assisted living facility for seniors in the mountains with the Castle Peak Senior Life and Rehabilitation Center. The facility, which opened in late 2015 and built on land donated by Eagle County, is managed by Augustana Care, a nonprofit based in Minnesota which manages senior care facilities across the country and includes 44 skilled nursing units, 20 assisted living apartments and 10 transitional care units. Castle Peak’s marketing director Monica McCarroll said that a memory care wing with 12 beds could open as soon as this spring. At the moment, 28 skilled nursing units and 15 assisted living apartments are occupied. McCaroll said that the facility came about because of strong local support and collaboration. Augustana Care also considered building a facility in Frisco to serve Summit County residents back in 2015. At the time, the plan was to create a senior housing and care facility on a 4.5-acre site called “Hillside Parcel” near St. Anthony and overlooking the Summit Fire Authority training center. However, Summit County manager Scott Vargo said that the plans fell through for financial and logistical reasons. 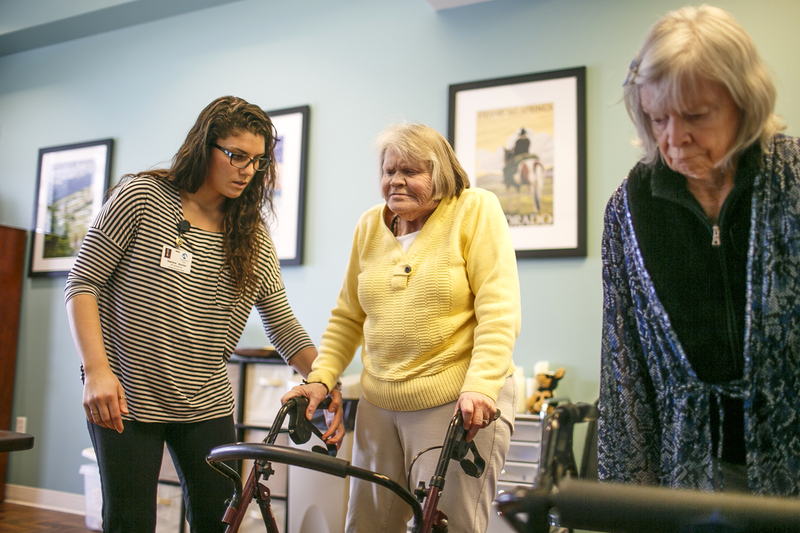 Castle Peak Senior Life and Rehabilitation Center employee Stephanie Sheridan leads a class session with the residents Wednesday, Feb. 21, in Eagle. With the high cost of real estate in the mountains Vargo said that finding another site for a senior facility is going to be challenging. He is not aware of any other plans for a senior facility Summit. Rosen said that even while recognizing the need for more senior services, altruism won’t be enough to attract them and medical research for senior health needs in the mountains. 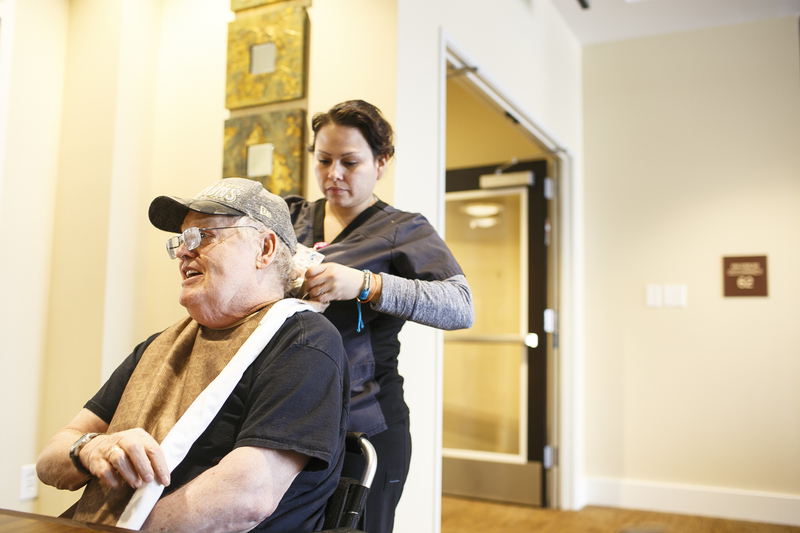 Anne and Ed Crane, who spent much of their adult lives trying to bring joy and purpose to Summit’s senior community, find themselves separated because Summit didn’t have the services they need. Eventually, Anne may leave Summit when she is no longer able to live independently, and the county will lose another one of its upstanding citizens. Editor’s note: This is the third installment in a four-part series from the Summit Daily News. Read Part 1: What’s the secret behind Colorado mountain towns’ peerless longevity? 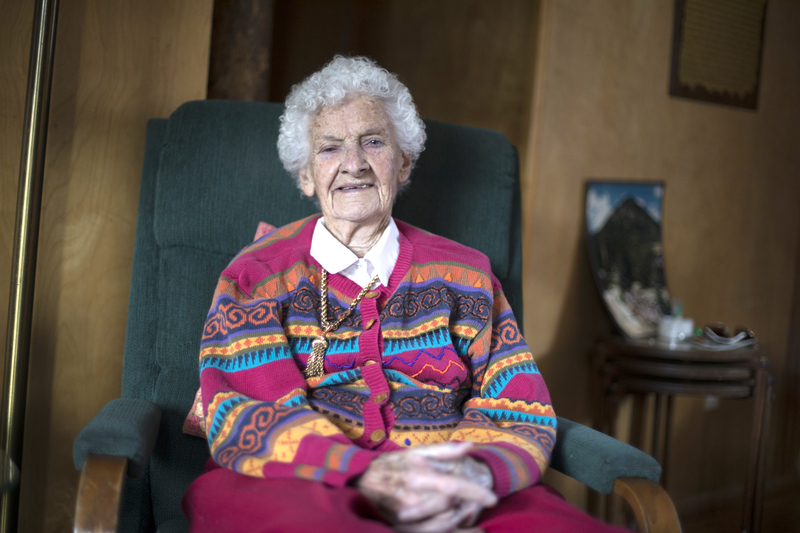 Part 2: Is Summit County a Blue Zone, a designation for areas around the world that have a high number of centenarians? Part 4 will print Feb. 23: We live longer here, but when it comes to caring for our aging population, many mountain communities fall short. Frisco resident Gretchen Tilden is 85 years old, and she spends much of her time these days painting. Tilden is engaging in art therapy to cope with the lingering effects of a serious brain injury she suffered back in 2013. Before the injury, Tilden was a physical force of nature. She was a ski instructor in Keystone for 15 years after moving to Summit in 1990, and never had any noticeable health issues. But then came the fateful day in 2013 when she was hit by an out-of-control snowboarder at Copper Mountain Resort. Brain injuries are one significant risk factor for the fearless, active seniors in Summit, but there are other concerns as well. At first glance, Colorado’s central mountain towns seem to have most of the ingredients for a long, happy life: breathtaking scenery, clean air, healthy people and a bounty of outdoor recreational activity that draws hundreds of thousands of people from around the world. It’s no wonder we have the highest life expectancy in the country. Dig below the surface, though, and you’re likely to find some sobering truths. According to the Robert Wood Johnson Foundation’s Annual Report, the mountain counties of Eagle, Pitkin, Routt and Summit ranked in the top 10 among all Colorado counties in health outcomes. However, Eagle and Summit also tied for having the highest rate of excessive drinking in the state. Mountain counties also scored poorly when it came to physical environment because of a severe housing shortage. For the working people in our mountain communities, those truths are evident every day. Some residents rely on free community dinners because they spend what little they have on rent. They might not be able to afford health insurance or afford the specialist who can diagnose and treat their hidden heart condition. To pay for a roof overhead, one might need to hold two or three jobs. To cope with the stress, they might turn to heavy drinking or other self-destructive vices. During the shoulder seasons, when most homes sit empty and when friends move away, they get lonely. These are people whose quiet suffering is rarely reflected in the cheery statistics about mountain life. In the past two installments of The Longevity Project, the Summit Daily explored reasons why Summit and Eagle counties have the highest life expectancy in the country. In this installment, we look at the areas where we fall short. An obvious bit of news for anyone who has tried to find a place to live or gone grocery shopping in the mountains: It’s really expensive to live up here. Just ask Dillon Mayor Kevin Burns. Back in December he announced he would not seek another four-year term as mayor this April, citing the high cost of living. To understand the housing problem, take a look at home sale listings on Zillow or any other real estate listing page. The median price for a single family home currently on the market is $789,000. Only 12 apartments or condos are currently available for rent on Zillow, with the average rent at $1,900 per month. A person earning $40,000 a year may wind up spending half their paycheck on rent alone. A household is considered “cost-burdened” by spending just over 30 percent of gross income on rent. The 2015 Self Sufficiency Standard for Colorado report issued by the Colorado Center on Law & Policy found that families in Summit have to make much more to afford basic necessities such as housing, child care and food. “A Summit County family with one adult and one preschooler, for example, needs an annual income of $59,595 to make ends meet, more than three and a half times the federal benchmark (for poverty),” the report concluded. 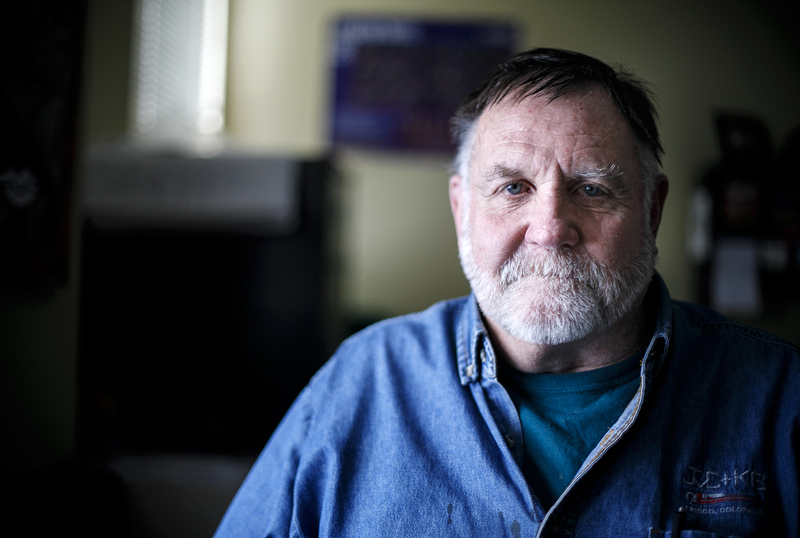 Summit County resident since 1987, Craig Woodring, 66, is bi-polar has not worked in many years due to his disability. “When I moved here, I made this my home. I don’t think I have to move and live somewhere else because I can’t afford to live in my home, just because I am disabled and old,” says Woodring, who chose to live close to family living in Summit County. Craig “Corky” Woodring, a local artist and former construction company owner who spent much of the past three decades living in Summit, doesn’t see the county doing enough to support the people who actually live here. Woodring also believes that the bedrock of a stable community — a foundation made up of long time residents and middle-class families — doesn’t really exist in Summit. Tamara Drangstveit, executive director of the Family and Intercultural Resource Center in Silverthorne, regularly helps people who struggle to afford living in the mountains. “It doesn’t matter if you’re looking at housing, health care or child care, costs are higher in Summit County,” Drangstveit said. Her clients often pay 40 to 50 percent of their income on housing, and 15 to 20 percent each on health care and child care. Dr. Ali Mokdad is a co-author of the study by the Institute of Health Metrics of Evaluation that placed Summit County at the top for life expectancy. He said that while socioeconomic factors do have a large impact on life expectancy, they aren’t necessarily the most important. “While health is correlated to socioeconomic issues primarily, you can be poor and still be healthy if you engage in the right behaviors.” Mokdad points to places like Yuma County, Arizona, which has a relatively low average income but managed to raise their life expectancy by eight years since the last study. Poor life expectancy, Mokdad explained, is primarily driven by behavioral issues, such as obesity, poor nutrition and excess drinking. But part of the problem for making those lifestyle changes is living in an environment that does not encourage them. In his Blue Zones books, author and explorer Dan Buettner proposed that the most sustainable way to improve a community’s life expectancy is to “reshape the environment” to steer people toward better habits and better lifestyles. He identified one key common trait across all Blue Zones communities: walkability. While counties like Summit have an exceptional trail and recreation path network, they don’t necessarily link to all the places people need to go. Many of those places are only accessible by car. 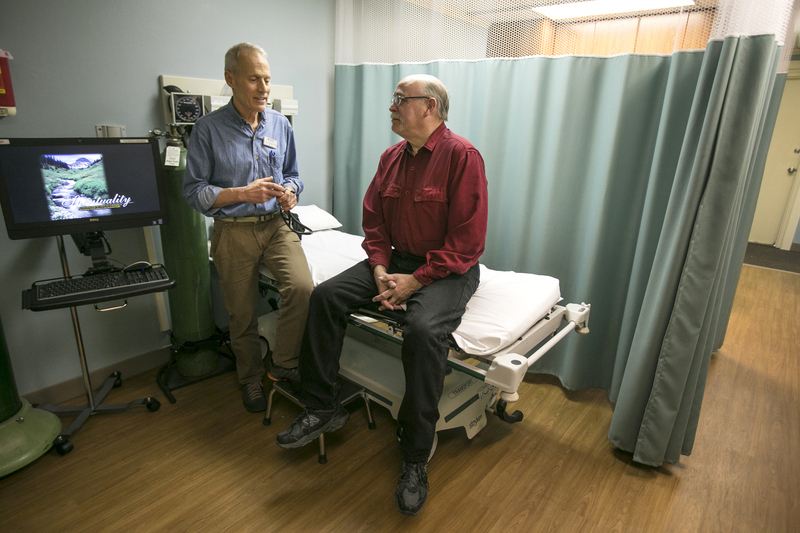 Dr. C. Louis Perrinjaquet, of High Country Healthcare, talks with his patient Keith Synnestvedt Thursday, Feb. 15, at the clinic in Breckenridge. Another issue in Summit is a relative lack of food accessibility. The public can look up local food accessibility statistics through the Food Research Atlas, an interactive map tool provided by the U.S. Department of Agriculture to find areas that are considered “food deserts” because of their lack of access to a variety of healthy food. While healthy fruits, vegetables, grains and beans are usually available at grocery stores, over 1 in 20 Summit households are in a situation where they don’t have access to a vehicle and live more than half a mile from the nearest grocery source. That means they have to take long, burdensome trips by foot to the supermarket, or rely on public transportation and be at the mercy of its schedule. Living at altitude isn’t for everybody, especially people who have difficulty breathing or other cardiovascular issues. Sometimes those issues are not readily apparent and pose serious threats to long-term health. Cardiac failure continues to be the leading cause of death in Summit County and nationwide. Dr. Peter Lemis said that one of the biggest health concerns at altitude are hypoxia, a lack of oxygen reaching tissues and pulmonary edema — a cardiac condition that can cause fluid buildup in the lungs. Lemis added that people with those conditions who do move up here often have to move away, as do people who have to move away due to other serious illnesses or injuries. That, he believes, is part of the reason life expectancy is so high in the mountains. 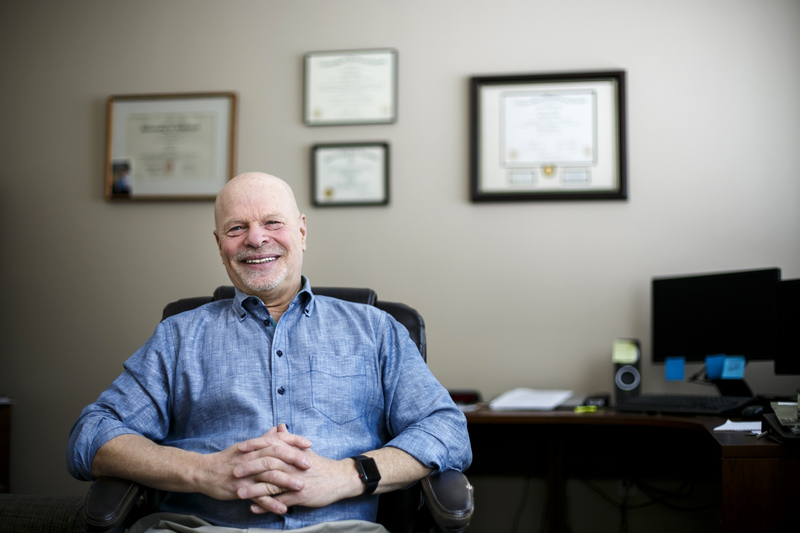 Dr. Jules Rosen, chief medical officer at Mind Springs Health in Frisco and former chief of geriatric psychology at the University of Pittsburgh, added that because most people living in Summit weren’t born here, they aren’t acclimated to the conditions. Dr. Jules Rosen in his office at the Summit County Care Clinic Thursday, Feb. 15, in Breckenridge. Dr. Rosen explained the body’s usual response to living in a place with less oxygen than what the organs need is to produce higher hematocrit levels, or red blood cells to carry that oxygen. The risks of having high hematocrit levels include blood clots and other serious conditions. However, despite the lack of oxygen in the Himalayas, those sherpas test for lower hematocrit levels. Dr. Rosen added that there are significant risk factors for seniors, like bone change. Being healthy and active doesn’t slow that down. Rosen also said that falls are one of the biggest safety concerns for seniors. Paul Chodkowski is CEO of St. Anthony Summit Medical Center in Frisco, a Level III trauma center and the largest health services provider in Summit. 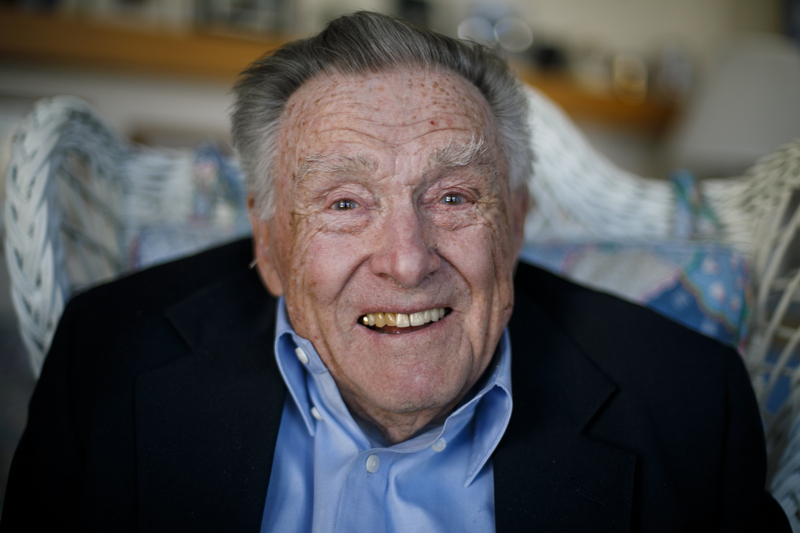 Early in his tenure, Chodkowski recognized the need for more study about health effects at altitude, especially as we age. Chodkowski found that there was a rising senior population in the area, and realized the importance of addressing their needs. He wound up hiring Summit’s first local full-time cardiologist, Dr. Warren Johnson. Though little research exists about the physical health effects of living at altitude, Chodkowski said that Johnson’s work produced positive developments. Chodkowski said that he hopes the research will help find better solutions and care for altitude-related illnesses and chronic diseases. In 2017, Eagle County recorded 13 suicides, the most anyone in the county can remember for a single year. In 2016, Summit County also had a near-record number of suicides, but in 2017 that number dropped significantly, a dose of good news that underscores the strides that mental health advocates have made locally in the last year. However, the struggle to bolster mental wellness in the mountains is far from over. Corky Woodring had his life shattered by mental illness. He once had a family, his own construction company and a relatively comfortable life in Summit. But depression and bipolar disorder made him lose it all, and he was forced to move to Pennsylvania for a time. There, he was briefly institutionalized to treat his mental illness. Carlos Santos is an independent living coordinator and peer counselor at the Northwest Colorado Center for Independence, a nonprofit that helps persons with disabilities and others obtain the help and resources they need to live independently. He regularly comes across individuals with mental health concerns. Santos added that while Summit and Eagle have done a good job improving accessibility to mental health resources, there are a lot of people who work here but live in Park and Lake counties. The Building Hope initiative is a grassroots community mental health initiative that is trying to address gaps in Summit County’s support network. Program Manager Betsy Casey believes that along with cost of living, the very nature of mountain communities make residents susceptible to depression. “We have long, cold winters that are nine months long instead of six months,” Casey said, “and combined with the isolation for young people who come here without a support network, it creates a perfect storm.” That isolation is compounded, Casey said, by the fact that mountain resort towns are transient communities, where people come and go and stable relationships are hard to maintain. Many turn to drinking or substance abuse to self-medicate as a result. Dr. Rosen believes that there may also be some physical reasons for poor mental health in the mountains. One concern he highlights is “nocturnal oxygen desaturation,” or low oxygen levels during sleep because of conditions such as central sleep apnea. That lack of oxygen and poor sleep may lead to psychological issues down the line. Dr. Rosen added that those mental health issues, whether environmental or biological in nature, might lead to dangerous behaviors such as binge drinking. Dr. Rosen said that he and Dr. Lemis have been hoping to do a serious study about sleep apnea at altitude. Chodkowski said that St. Anthony Summit has also been looking into researching sleep apnea and oxygen desaturation. Dr. Rosen maintains that the physical and mental health issues he mentioned eventually push people out of the mountains, and that is the real reason life expectancy is so high here. Gretchen Tilden’s brain injury cost her dearly. Because of the chronic vertigo, she had to give up downhill skiing, her true passion. She can’t even do cross country anymore. Now that she can’t do much of what she loves, Tilden said she is going to wind up moving to the Front Range. “There’s not much more left for me to do up here,” she said. She believes she will be taken care of down in Denver, where senior care services are much more readily available. Tilden managed to live to a ripe old age by avoiding excess drink, staying active and healthy and keeping a positive mindset. However, the accident left her needing the kind of care she can’t get in the mountains. 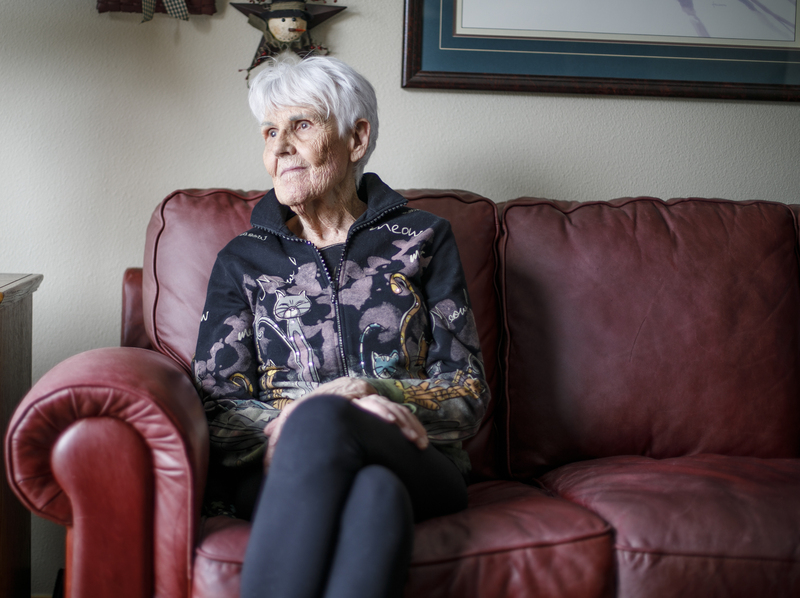 She is one of many seniors having to abandon their perch at 9,000 feet because of a lack of senior services. In our next installment, The Longevity Project will look at whether our mountain communities are doing enough to care for the burgeoning senior population, which has nearly doubled over the past decade. 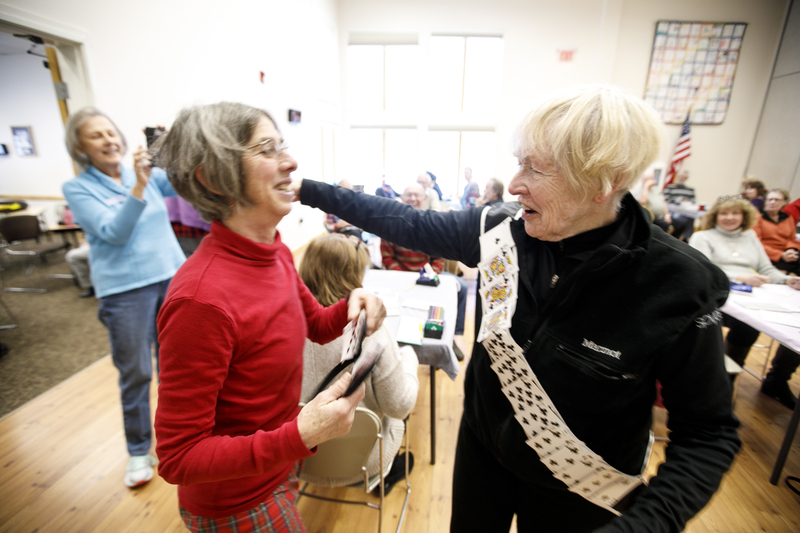 In the month of February, the Summit Daily News produced a four-part series on longevity in the mountains, running on Fridays in print and online features that included multiple videos. The Longevity Project finished on Tuesday, Feb. 27, with a speaker event featuring Tony Buettner of the Blue Zones.At the final event, the Summit Daily News presented a video showcasing the High Country’s “super seniors,” and their views on the secrets to a long life. Watch the video above.More videos can be found with each of The Longevity Project stories. 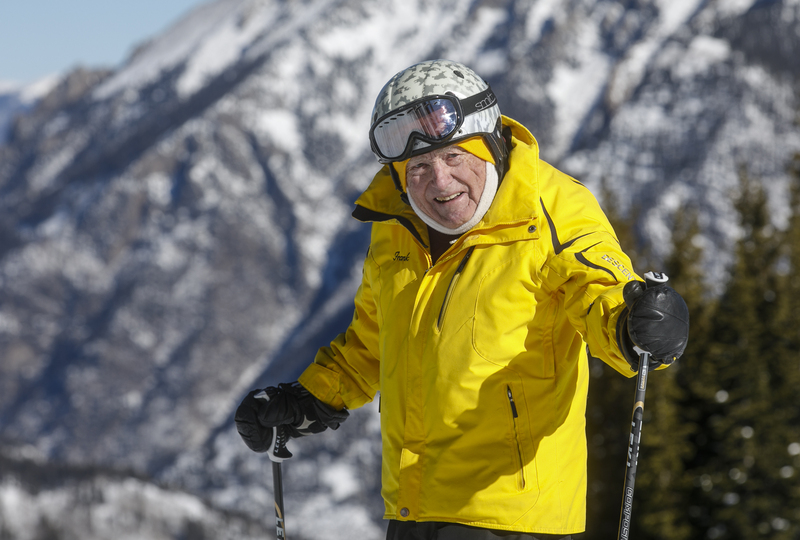 Whether they’re cross-country skiing, gardening, quilting, biking, playing cards or volunteering — seniors in Summit County participate in activities that enrich their lives and keep them on the road to longevity. Thanks to the Summit County Community and Senior Center, which works in collaboration with Summit County Senior Citizens, anyone over the age of 50 in the county has access to all they need and more in order to stay active, get quality medical care, socialize and more. Research from Blue Zones, geographic areas whose residents have the longest life expectancies in the world as evidenced in the book, “The Blue Zones,” by Dan Buettner, shows physical activity is one of nine healthy habits practiced by the world’s longest living populations. The other habits include finding a sense of belonging, never overeating, eating a diet heavy in vegetables, putting family first, enjoying a glass of wine or two per day, having purpose in life, unwinding from stress and spending time with others who practice similar habits. 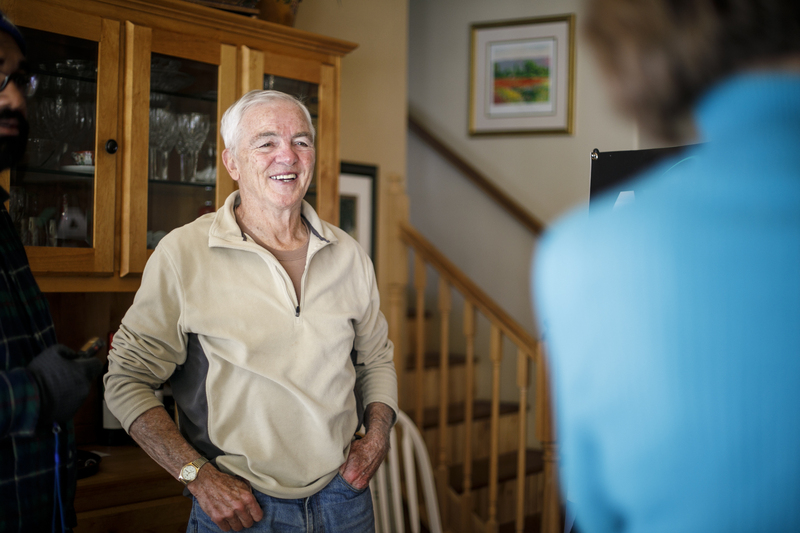 In Summit County, which has the highest life expectancy in the country according to a study published last year in the Journal of the American Medical Association, the other healthy habits on the Blue Zones list are normal ways of life for local seniors. Having a meaningful sense of purpose in life may help us live longer, according to research published in the journal Psychological Science that found this sense of purpose predicted lower mortality risk in a study of more than 6,000 participants. Longevity might be the long-term bonus of feeling a sense of purpose, but the more immediate benefits are obvious in the attitudes of local seniors. Bainbridge said the seniors wouldn’t feel nearly as young as they do without their involvement in the Senior Center. 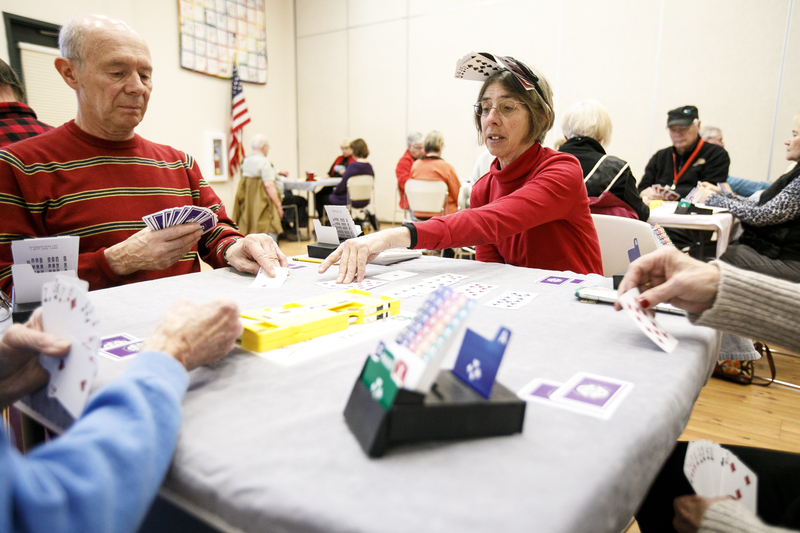 Many Summit County Seniors participants are able to enjoy a wide array of physical and recreational activities, but that shouldn’t preclude those who aren’t as physically able anymore from joining. The Senior Center serves elderly seniors and those with special needs, also. For those who can do more, many find they can do even more than they realized once they’re part of the group. A quick glance through the center’s 16-page monthly newsletter reveals a veritable cornucopia of activities and programs. While skiing, hiking, bike rides and other outdoor recreation are part of the normal calendar, some less physically-demanding activities that keep in line with the Blue Zones’ healthy habits include a book club, group excursions such as the annual Rockies game, Monday night dinners, group games like bridge and mah jong, yoga and more. And while fun and games is a huge part of what they do, the seniors also find support for other equally as important tasks related to aging. Work is consistently ranked as one of the highest causes of stress for Americans, yet workers often let too many of their hard-earned vacation days go unused each year. The State of American Vacation, an annual survey of American workers’ vacation habits conducted by Project Time Off, shows Americans took an average of 16.8 days of vacation in 2017. It’s about a half-day more than the average in 2016, but still way down from the average of 20.3 days taken between 1976 to 2000. If work is one of our main causes of stress in life — according to the annual Stress in America survey — why aren’t we taking enough time away from it to unwind? Breckenridge is a place that offers countless ways to unwind. Whether you want outdoor recreation or total relaxation, it’s a worthy destination to put those vacation days to use. The American Psychological Association recommends taking time to replenish by “switching off” from work in order to avoid the negative effects of chronic stress and burnout. When people come to spend a week in Breckenridge, Wagner said they’re looking for an unforgettable experience. 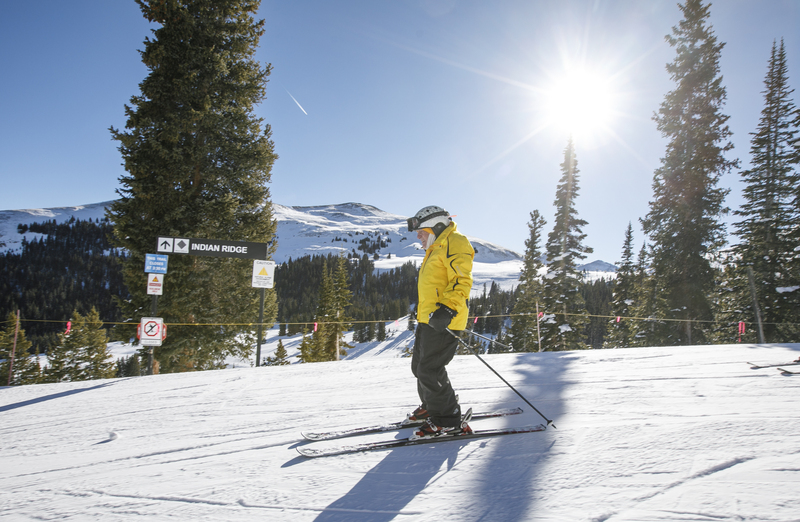 Breckenridge Grand Vacations has an Activities department that provides guests with the tools they need to go out and enjoy the mountains, or stay in and get pampered in a spa. In-house activities include crafts such as jewelry and candle-making canvas painting, beer tasting and more. These activities are designed to bring out the creativity in those who have “checked out” from the stresses of real life. 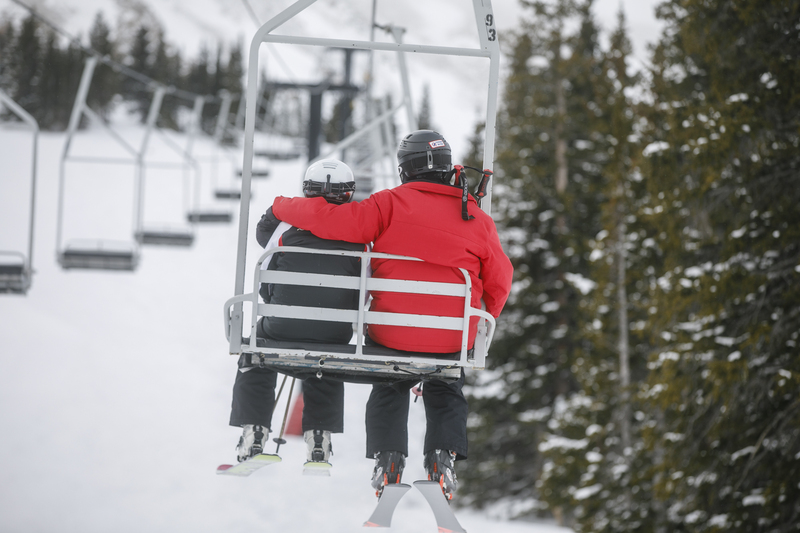 And for those looking to increase their heart rates a bit more, Breckenridge Grand Vacations’ resorts can arrange hikes, snowmobiling, zip lining, horseback riding, dog sledding and more. Summit County’s life expectancy is the highest in the nation, according to a study published last year in the Journal of the American Medical Association. The study noted Summit County’s high education, high income, high access to medical care, level of physical activity and low obesity rate as reasons for residents’ longevity. 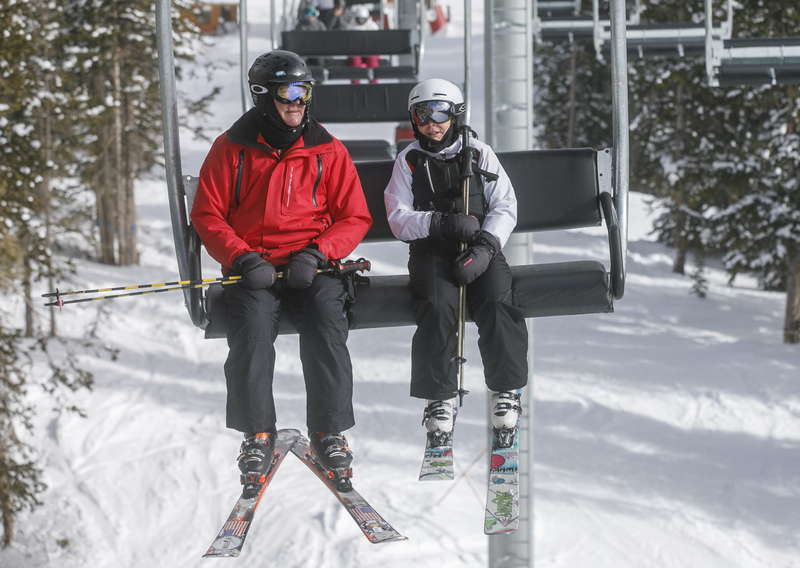 Breckenridge Grand Vacations staff practice what they preach. Wagner said the company has a wellness initiative that encourages a healthy work-life balance. From utilizing indoor fitness centers or recreating outside, to relaxing by the pool, vacations in places like Breckenridge are about rejuvenation. Wagner describes Breckenridge Grand Vacations as being in “the smile business,” which turns out to be yet another predictor of longevity. Research shows that smiling can lift our moods, lengthen our lives, fight off stress and more. Have you ever let wet clay run through your fingers in a pottery class and felt its silky texture soothe your soul and calm your mind? Or, maybe you’ve experienced a stressful day but found relief and release through painting, writing, photography or music. Dozens of studies on the relationship between creative arts and health show the mind’s ability to heal itself when stimulated. When we let our creative juices flow, there are countless other positive effects that happen in our minds and bodies. “Aside from providing therapeutic benefits, the creative arts also provide a range of cognitive benefits including retrieving information from memory, problem solving, communication, and focus,” said Becca Spiro, director of Learning and Engagement at Breckenridge Creative Arts. looked at numerous scientific studies on the health effects of music engagement, visual arts therapy, movement-based creative expression and expressive writing. The results make a case for creativity’s relationship on our health as we age. The review indicates that creative engagement can decrease anxiety, stress and mood disturbance. It also states that creative engagement contributes to many aspects of physiological and psychological conditions typically associated with good health. Here are some of the ways these healing powers are being experienced at Breckenridge Creative Arts. Creativity stimulates the mind and increases brain function. One study by the Mayo Clinic showed that middle-aged and elderly people who engaged in activities such as painting, sculpting, ceramics, sewing and other crafts could preserve their memories and reduce their risk of dementia. Creativity through physical processes such as carving a woodblock or completing a ceramic project can alleviate stress and build confidence, Spiro said. “A stimulating art exhibition provokes thoughtful conversation, fostering friendship and creativity,” she added. The American Journal of Public Health review of various creative expressions showed that the movement of mind and body in a creative way can lead to the relief of stress and anxiety, as well as other health benefits. Poetry, for example, can offer self-expression not otherwise possible through everyday words. Logic and reasoning are benefits not commonly associated with the arts, Spiro said. One example might be a person’s experience while viewing contemporary art and coming to their own conclusions about that art with limited information. Upon learning a new skill — whether it is sewing or glassblowing — we are bound to make mistakes, Spiro said. It’s the growth we achieve in overcoming those mistakes that leads to resilience. “We may even fail, but we learn that we can start over, and that’s OK,” she said. Breckenridge Creative Arts participants often sign up for a class to meet new people or to learn a new skill, but the most valuable feedback comes from patrons who have ventured outside of their comfort zones in the studios. “These people leave campus with a new self-confidence, energy, and sense of adventure,” Spiro said. Aging adults with strong social networks can lower disease risk, lower blood pressure and increase immune system functioning, according to a study of social relationships in PLoS Medicine that says social support can increase long-term survival by about 50 percent. Creative classes such as those at Breckenridge Creative Arts have the ability to not only stimulate minds toward optimal physical health, but they bring the community together in a relaxed environment.